AOMORI—Men wearing only a shred of coarse fur hunt animals in the mountains while women and children gather shells and forage for nuts. This was the prevalent image of people of the Jomon Period, which lasted from about 12,000 to 2,300 years ago. But when the Aomori Prefectural Government began surveying a site for a suburban baseball stadium in 1992, this image was shattered. A few meters below the surface of the 5-hectare site, workers found countless relics 4,000 to 5,500 years old. They also found the ruins of a tall building, roads and wooden tools, making it the largest Jomon village ever discovered. When the prefecture canceled the stadium project and continued its exploration of the ruins, more findings from the Sannai-Maruyama site surprised archaeologists. Jomon relics including lacquerware, jade pendant heads, stone masks and pot shards, which filled some 40,000 cardboard boxes, were unearthed. More than 700 remains of dwellings and long rows of human graves, one measuring nearly 420 meters in length, also were found, said Yasuhiro Okada, chief of the Sannai-Maruyama Site Preservation Office. Some findings from the site shed new light on the still-mysterious life of the Jomon Period. Experts agree that the village thrived for the entire 1,500-year period, reversing previous assumptions that Jomon hunter-gatherers ran in nomadic tribes. The land was systematically divided into areas for dwellings, storage, burial and dumps. Okada pointed out that this revelation introduces the possibility that people then knew how to plan a village. The site also revealed that the Jomon people had more advanced skills than was previously believed, Okada said. In four of the six excavated holes, each measuring 2 meters across and 2 meters deep and lined up in two orderly rows, roots of burned chestnut trees were found. The research teams concluded the trees served as pillars as tall as 15 meters. The team also found that the holes were tilted inward slightly, indicating that the six pillars must have supported a roof or top floor. Finds of cultivatable plant seeds, such as bottle gourd and burdock, and the recent genetic study on chestnuts revealed that the villagers may have engaged in farming, Okada said. Jade products, apparently from Niigata Prefecture or Hokkaido, and amber products, presumably from Iwate Prefecture, were also unearthed at the Sannai-Maruyama ruins. Experts said they are convinced the villagers traded with remote places. Although similar Jomon ruins have been unearthed in many other parts of Japan, the Sannai-Maruyama site is the only one that reveals the overall structure of a Jomon village, Okada stressed. "Discovery of the Sannai-Maruyama site creates the possibility that Japan could have been one of the origins of civilization," said Tetsuro Morimoto, an expert on comparative civilization. "We might have to rethink our preconception that Japan imported most of its culture from the continent." But Makoto Sahara, curator of the National Museum of Japanese History, said he thinks the recent craze over the Sannai-Maruyama site is misleading. "The intensive publicity gives the impression that the Jomon culture was fascinating and rich," he said, adding that only the tribe of the Sannai-Maruyama period was affluent and only in relation to food gatherers of that period in that region. Archaeologist Kiyoshi Murakoshi feels the massive attention given to the site derives mainly from the investigation covering such a large area—about 38 hectares. Murakoshi said the site is the largest area of Jomon land ever studied, which partially accounts for the large quantity and great diversity of relics discovered. In this respect, he feels it can very well be called the site that represents the Jomon Period. Experts also debate over the estimated size of the village. 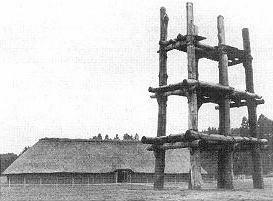 In a symposium on the Jomon culture held here in September 1994 panelists concluded the village probably had about 500 people at its peak, judging from the number of excavated relics and the amount of labor needed to carry and erect six huge chestnut pillars. "Considering the number of people needed to engage in labor, trade and earthenware production, I think there were over 1,000 people living here," Morimoto said. Murakoshi reiterated his logic, but with a more modest estimate of 250 to 500 villagers. "This village required at least 250 people to operate in the way we imagine," he said. But Sahara challenged them, saying the number is far too large for a Jomon village. "All other Jomon villages found in Iwate, Akita, Fukushima, Niigata and Nagano prefectures are said to have had only 10 to 20 dwellings, with the largest possible population being 100. I doubt the Sannai-Maruyama village could be so different from the others," he said. Morimoto pointed out that the number of earthenware items found in Sannai-Maruyama is far greater than at other sites. He estimated the number to be three to four times greater than what would have been needed by 500 people. Sahara argued, however, that the current method of analyzing the age of earthenware found could be off by plus or minus 100 years. "So such relics can be from the same period, but may differ that much from each other in age. And think about how much someone can consume in 100 years," he said. Overestimated or not, the discovery of the site has certainly fostered more local patriotism in the region, which was previously just another topic in ancient Japanese history, Okada said. More than 1 million people have visited the site since it opened to the public in August 1994. Last March, part of the Sannai-Maruyama ruins zone was declared a national historical site. The notion that this could have once been the center of Japan has changed the perspective of people in Aomori, said Okada, who has been working at the site since 1992. Now nearly 120 Aomori citizens work as volunteer guides at the site, and are eager to provide information to visitors. "I want people to reconsider their fixed ideas of Japanese history and our prefecture," said Yoshiaki Murakami, 64, an Aomori resident who volunteers at the site. Even more remains to be discovered in the future, Okada said. Because excavation can be conducted only during summer, only 20 percent of the site has been uncovered so far. "The more we dig, the more wonders we encounter," said Okada, adding that there is no right answer to many questions.